The last few days on the Oswego River here in Upstate New York have been a roller coaster. Last Tuesday Syracuse got more than three inches of rain, which pushed the river from 1,800 to more than 12,000 cfs and drew lots of salmon to the dam. However, the awesome bite only lasted a few days while the water was up. 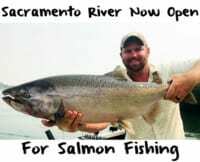 Rather than holding the water back and keeping our river levels higher to draw salmon in they dropped the river back down to 3,700 cfs over the weekend, which is where it was when we fished today. Many of the fish that were pinned to the dam late last week and providing us with awesome fishing retreated to the lower river when the water receded. Now they are scattered throughout the system and tougher to catch. For this time of year there should be way more fish in the system. But, with them shutting the water down the fish have dropped back and I’m hoping there’s more to come. It’s been a weird year so far, just like our lake season was. The water in the Oswego is still 63 degrees. It should be in the low 50s this time of year. Fortunately, our run isn’t near the end. We should have salmon around for the next few weeks. I’ve only had two loose fish so far this year so we know the fish aren’t ready to spawn yet. I’ve only had one huge fish this fall. When it comes to size this has been an average year. 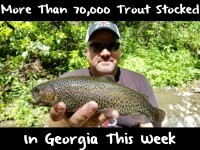 They are averaging 18-22 pounds and we are catching rainbows mixed in with the salmon right now. 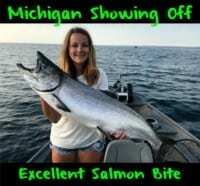 While we are catching fish each day, in spite of the warm water I think we need colder weather to turn the bite on. The fish are weirded out because the water is too warm, which happens every year until the water cools down. It’s like September fishing right now. The bite has been an egg bite. As a matter of fact, even the guys on the bank are casting and drifting bobbers with eggs. Larry’s Salmon Shop is selling lots of cure this year rather than hardware. Personally, my guys are using slip floats with skein. All our fish have come on chartreuse Fire Brine eggs and even more pink FireCured eggs. We’re using 14-pound Suffix as my main line with 12-pound fluorocarbon leaders. The water is pretty clear. I can’t go any heavier and get bites. Half the time after we hook the salmon we have chase them downriver because the line can’t handle them. Editor’s Note: Kevin Davis operates Catch The Drift out of Oswego, New York. For more info on his fall, high-action salmon trips please visit http://www.catchthedrift.com/.